SO YOU WANT TO UPGRADE YOUR LIPSTICK HOLDER? So I'm just going to be honest and make a confession many of you may not know about me........ I LOVE LIPSTICK! There I finally said it out loud and I don't care who knows it. I know you may not think that looking at my social media accounts. I have three to four go to colors that I automatically just grab when I'm doing my everyday looks. That doesn't mean I don't own more colors from black to even yellow. It seems like every time I get one of the mac mailers in the mail and see one it's new collections I grab my purse and run out the door. Only to ironically have them sit in my lipstick container or be given away to whomever raids my makeup box and begs and pleads for it. I didn't realize how many I had actually collected until I picked up the cutest 30 lipstick holder from my local Marshall's. 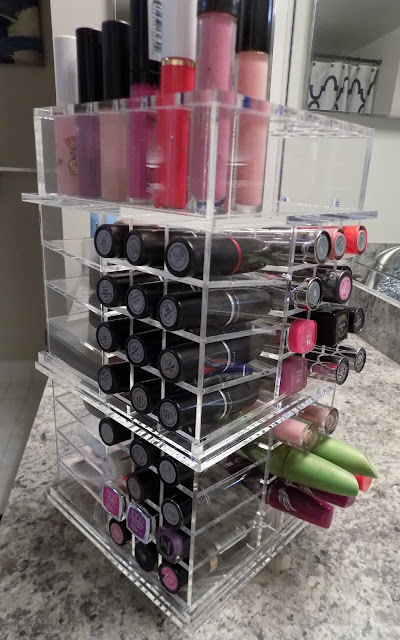 I was in love until I started to organize and realized between lipstick and lip gloss I had almost 60 containers and that little cute container was no match for a lipstick addict like myself. I searched high and low for a reasonable bigger organizer that was both chic and functional. Then it happened I discovered Bella Posh Oraganizers and went crazy with excitement. I was gifted the item and couldn't wait to open it and organize my lipsticks. I chose an all clear organizer but it comes in other color such as pink and black. I just feel as if clear can be timeless and can pretty much blend in just about any surrounding with out needing to work around the color the organizer. I choose the Grand Spinning organizer which retailed for $114 other organizers on the site go up to $200 dollars. 2 sides are designed to fit 48 lipstick. 1 side has 8 spaces to fit, eye shadow, blushes or powder. 1 side is designed to fit, foundation, primers, lip balms, nail polish etc. The shipping was super fast and arrived in under a week of placing my initial order. I was expecting to wait longer but super glad that I didn't have to. When ordering online you sometimes become accustom to the waiting game. I have placed all of my lipsticks and lip gloss in my orgranizer with room left to add to my collection. I also used space for my eyelashes and pressed powders. I chose to keep my organizer in my bathroom and it fits perfect. It's not bulky or taking up too much space it fits in just perfect and did I mention it spins? Yesssssss *jumping for joy*. 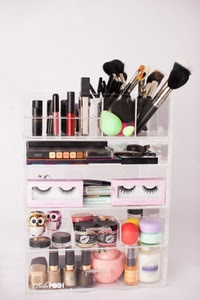 Honey I just felt so amazing spinning my little organizer looking for my daily beauty products this morning. 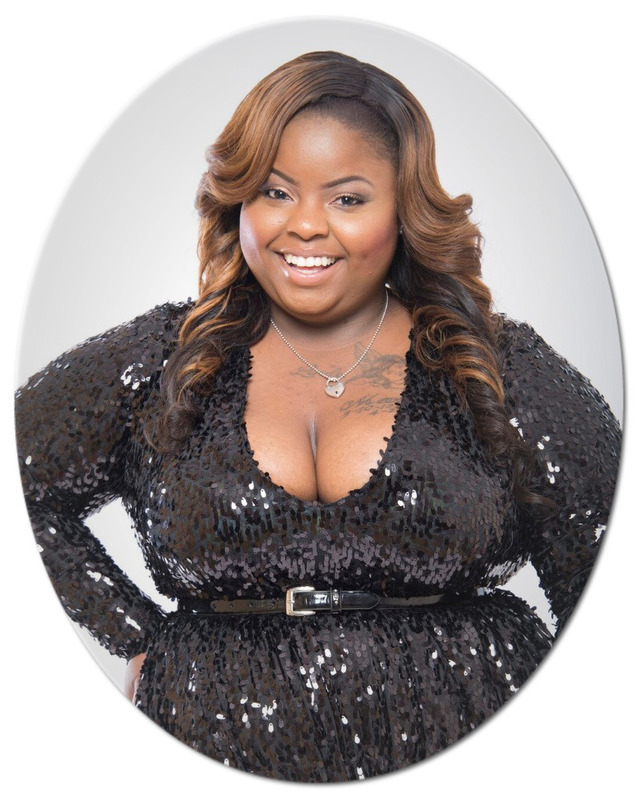 I will be ordering a few more items from the site maybe even the Queen Organizer and a Make up Brush Holder. 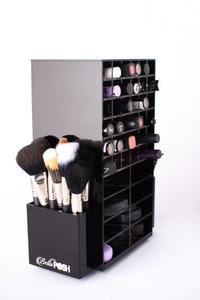 If you are looking to upgrade your beauty organizer I recommend totally recommend Bella Posh!